When You Discover the Real Truth Behind Cooking, You will want to "Burn Your Recipes"
"The best cooks know... It's not WHAT you cook, it's HOW you cook." A﻿﻿﻿ll of the Burn Your Recipes Lessons and Instruction in 3 DVDs shipped to your door! every night of the week? I have heard all of the excuses and believe me, I understand and can relate to them all. You know that using fresh, whole foods and preparing your own meals at home is the healthy way to eat. But the planning, shopping and prepping takes time - and you're busy! You might even think: It's just easier to let someone else do the cooking so you resort to take-out, fast food and prepared foods more often than you'd like to admit. But the Good News is that COOKING DOESN'T HAVE TO BE THIS WAY! Who am I and what do I know about Your Cooking? Well, for starters, I am someone who understands where you are coming from because I used to be in the same boat! Long before I became a chef, I was a regular guy who loved to cook and really loved to eat great food. I even considered myself a pretty good cook, but in reality, I had my 5 or 6 "go to" meals that I could confidently prepare and they never let me down. Sometimes these new recipes would turn out OK, sometimes great, but often they did not turn out at all - and I never knew why. I didn't know what I had done "wrong" and what I could do next time to correct it. Eventually, my passion for cooking, my frustration with recipes, and my thirst for knowledge led me all the way to Culinary School. It was there I learned a very important lesson: Cooking is NOT about recipes. Cooking is about learning the fundamentals - I call them Basic Cooking Methods - and using those fundamentals as building blocks for cooking anything, and everything! But for you - it's going to be a whole lot easier than that! Learn the Fundamentals -the Basic Cooking Methods behind all Cooking. Pinpoint the ingredients you like (or have) and apply the appropriate method. Enjoy an endless variety of unique dishes that you can dream up every single day. Learning to Fish - Master a repeatable process that can be used over and over. We've all heard the parable: Give a man a fish, he eats for one day. Teach a man to fish, he eats for life. It's a Tuesday night. You are getting home later than you expected and you have nothing planned for dinner. Do you stop for take-out? Heat up a frozen dinner in the microwave? I don't know about you, but this is something that used to happen to me all the time! You just go straight home. You open your refrigerator and cupboards to see what you have. You pull out some very simple ingredients that you have on-hand. You choose your favorite cooking method, maybe tonight it's Sauté. 30 minutes later you are sitting down to a simple, healthy delicious meal that you whipped up on the fly. Cooking is not about Recipes. Recipes are wonderful resources for getting new ideas and inspirations, but without the knowledge of Basic Cooking Methods, the fundamentals of all cooking, recipes are at best incomplete. You can never get better at cooking if you are re-learning it every day. Without understanding the HOWS and WHYS of cooking, you are starting each new cooking endeavor at Square 1 instead of building your skills and expanding your knowledge every time you cook. Cooking is much easier and massively rewarding when you Cook Freely, like the Pros do, with knowledge, inspiration and creativity. When you discover the Basic Cooking Methods, like professionals do in Culinary School, you have the keys to unlock your creativity, as well as an endless variety of new meals that you approach with confidence. But what is also true is that this is simple, and anyone can learn it. Awesome Meals Every Night of the Week? The 4-Hour 3-DVD Set that has been called "The Encyclopedia of Cooking." It is designed to teach all of the fundamentals of great cooking that every home cook needs to know. Best of all, the information is presented in a straight-forward, A-Z approach, with no fluff because I know you want to learn fast! "NEW and EXCITING and very approachable..."
"This is a fundamental change from cook book instructions. This cooking instruction is NEW and EXCITING and very approachable for the average person to transform the way they prepare and cook food. Based on my own personal experience with Chef Todd's cooking instruction, I am positive it will make you 300% better! Chef Todd is informative, skilled - both in the kitchen and in education. The DVD is at a pace that keeps you interested. Viewing a few chapters prior to starting a meal should improve your delivery many times over! For less than the cost of one night out to dinner, anyone who likes to eat should own this DVD." 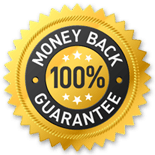 "It has actually saved me a lot of money overall..."
"At first I thought this DVD set was expensive but I got it anyway because of the 60 day guarantee. I found out that it was worth the money and effort. This DVD set has improved my skills in the kitchen, teaching me how to properly saute, how to make a smooth sauce and the correct way to grill. It has actually saved me a lot of money overall." "I don't feel that I have to refer to cook books any longer..."
"With Burn Your Recipes, I don't feel that I have to refer to cook books any longer. I have Learned how to stock up for fast everyday cooking. Buy it. No matter how well you cook now, it will improve your skills." 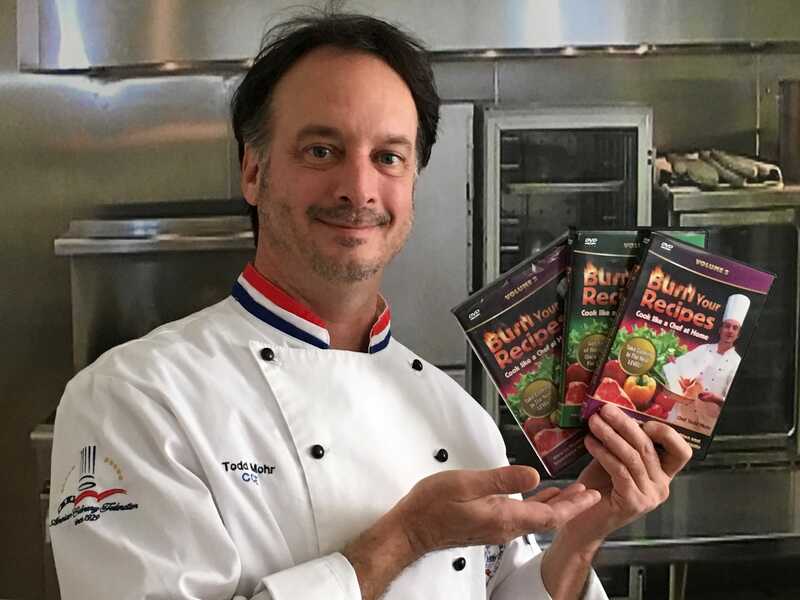 Get the Complete Cooking Collection Now with my No Risk, 60-day Money-Back Guarantee! Master the best time-saving tricks in the kitchen - your basic knife skills. Start enjoying prep with these classic knife cuts and short cuts. Cook your way to improved health and nutrition using whole foods you prepare in your own home. Proudly serve attractive food for guests by learning the best and easiest methods for cutting over 25 of the most common household meats, fruits and vegetables. Equip your kitchen with ONLY the necessary pots, pans and tools you'll need. Recognize how food becomes spoiled and learn how to prevent it and extend the life of your food. Be a smart knife-shopper. Learn the construction and use of the four knives you absolutely must have in your kitchen. How to protect the nutritional value of cooked food and retain its fullest benefits. The four main "tastes" and how these variables affect all cooking. All of the rules of controlling heat to achieve optimum results every time. The essential kitchen pantry items and staples for everyday cooking success. Chapter 9: Bouquet Garni Sachet – how to leave flavors in your food without leaving herbs and spices behind. Chapter 10: Nuts – Add flavor, color, texture to any meal. Chapter 14: Pasta, Grains – Dried items to have at your disposal to compliment any meal. Chapter 17: The Basic Elements of Recipes Revealed: Now Start Discovering Your Own Recipes! The mysteries of the 5 Mother Sauces (plus one!) These easy-to-master techniques will enable you to master all sauces! How to master the tricky techniques of preparing perfect vegetables. Part 1: Basic Cooking Methods Revealed. Part 3: The secrets of retaining flavor, color, texture and nutritional qualities in vegetables. Practice all of your knife cuts using this essential guide! You'll use this every day! for quick and easy everyday cooking! so you can control heat vs heat controlling you! A complete resource of cooking terms and definitions! A great easy-to-use quick reference of the Mother Sauces, foundations of all sauce-making! so you can cook vegetables everyone will want to eat! 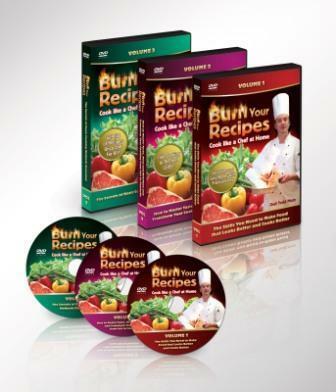 Get these DVDs in the Burn Your Recipes Series now along with all the awesome bonus gifts! Try them and use them for 30 full days. 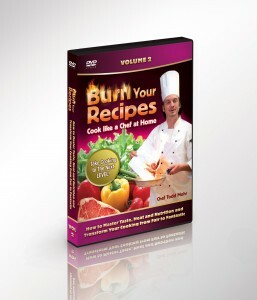 I promise you will be a better and more confident cook after using this DVD Series and the instruction contained within. 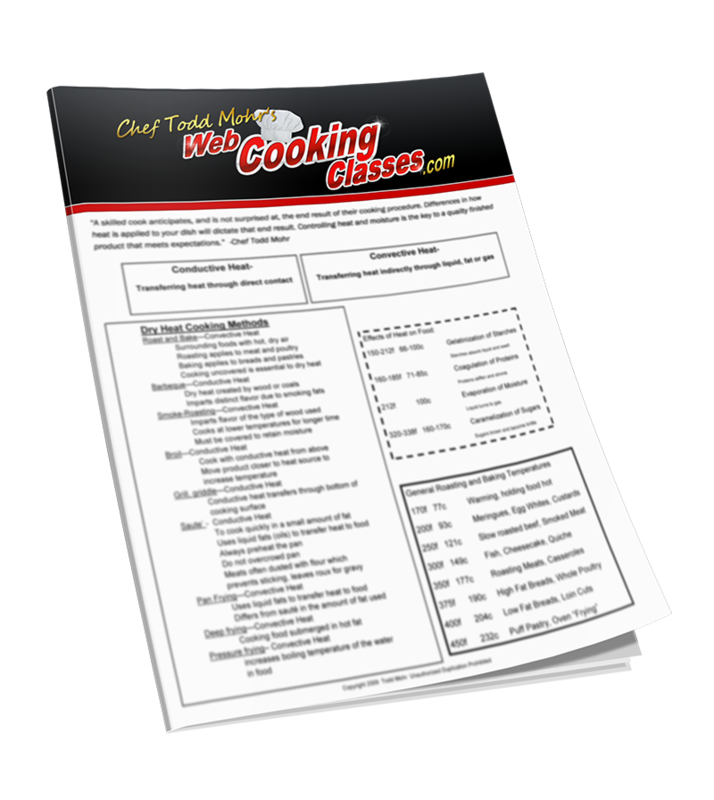 I'm SO excited to help you take this next step in your cooking - RISK FREE. Click below to grab your copy of this game-changing cooking DVD set now!!! "Burn Your Recipes DVDs has given me the quick tips I need to cook without a cookbook. It has been a great way to learn more about cooking." "Knowledge that has given me new ideas..."
"This DVD set made me realize i was doing everything the wrong way. I now have more knowledge which has given me a lot of new ideas and enabled me to learn a lot of new dishes & new flavors." "Cooking has become fun...through freedom from recipes..."
"This DVD set has eliminated the expense of cooking with recipes from my life. I now have confidence in my cooking, ability to think beyond the recipe and the skills to focus on cooking with what we have in the house, which is a big money saver. I have quit cooking with recipes, and have expanded my cooking repertoire by cooking at least 3-4 times per week, using what I've learned. I've already been telling friends about it, and telling them the fun that cooking has become through structured success--and through freedom from recipes." "Taking more risks and trying new things..."
"Getting inspired and exciting about cooking..."
"I understand what I am cooking and why..."
So...what is stopping YOU from cooking Awesome meals every night? Now it's time to take that next important step. The one you've read about on this page and envisioned for yourself. It is the path to knowledge, confidence, and better cooking - no matter WHAT you cook! The "Burn Your Recipes" DVD set is will show you quickly, and simply, step-by-step from basic methods to advanced cooking techniques. It will give you the confidence you need to ignite your creativity and open up a whole new world of food and cooking. This DVD set and the 9 Bonus guides are the result of decades of intense training, research and experimentation. I've condensed it all down for you in one complete DVD set that you can consume in an afternoon. I will buy it back from you for exactly what you paid. And you will keep all 9 Bonus Guides as my way of saying "I'm sorry" for letting you down. The bonuses alone are worth the price of the entire program and they are yours to keep even if you return the DVDs for a refund.